The Gosforth Road Club was founded on the 27th July 1951 and its badge, the Keep of the Norman Castle in Newcastle was adopted from the emblem of Gosforth Urban District Council, the local administrative authority. The club colours of tangerine, green, and white were taken from the emblem. The original design was a white jersey with three horizontal bands around the chest, the tangerine being the largest of the three. The sleeves and neck were ribbed in tangerine and green. As was the norm at the time the jerseys were made of wool and it was common for the top to have two breast pockets as well as three rear pockets. Dave Watson scores a win at Cottage Homes, Ponteland in 1966. The club was originally formed as an offshoot of the Ridley Cycling Club. Initially it catered for riders wishing to participate in "mass start" road races. The riders of the time belonged to the British League of Racing Cyclists. The members of the N.C.U regarded them as renegades. The members of this organisation were primarily concerned with the discipline of Time Trialing. 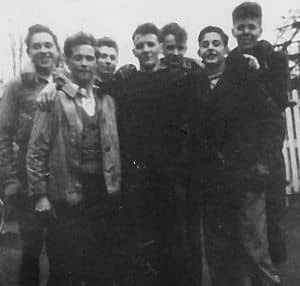 Left to right: Gosforth members John Bratton, John Craig, Alan Lawson, Doug Shield, Don Lockett, Tom Arnott, and Malcom Tate enjoy a post Christmas trip to the Beresford Arms in Whalton, 1953. In 1964 the club merged with the Tyne Olympic Road Club. Three clubs initially entered into discussions with a view to a merger. The clubs involved were the Gosforth R.C., the Olympic R.C. and the Tyne Electric C.C. Electricians who were employed at Parsons formed the latter Club deriving their name from their trade. The new club retained the name Gosforth R.C. and adopted the colours of the Olympic R.C. namely red and ice blue. These colours were retained until 1971 when the colours reverted to green and orange, the white being omitted at this time. There were a number of variations in design before a design incorporating diagonal wedges of green white and orange was adopted in 1987 at the time the club entered into a sponsorship agreement "Systems 4", a double glazing company based in South Shields. This was superceded by the current design which was adopted in 2004. 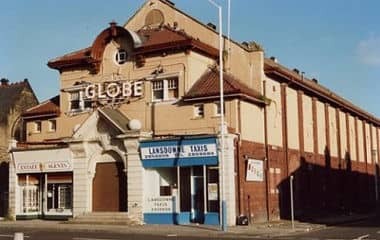 The Globe Cinema Salters Road, original meeting point for Gosforth club runs. By the early 1960's the club had an active membership approaching 40 many of whom regularly raced in all disciplines. The club had a large schoolboy and junior section. Sunday club runs were run on very formal lines with a club captain organising the route and even the pace. These runs regularly exceeded 100 miles and included both lunch and tea stops. The clubrooms at the time were the Conservative Party local meeting rooms situated just off Station Road, South Gosforth. In 1965 the club moved to new club rooms on Jubilee Road. 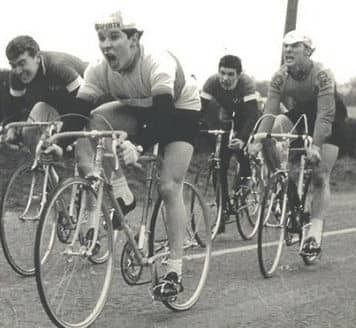 From 1962 to 1966 the club slowly declined in numbers and by 1968 there were only two, one racing and one none racing members, Dennis Fairley and Peter Harrison and this remained the same until 1976 when some of the former members started cycling again. By 1979 the membership had again risen to 20 active members. Racing success for Gosforth founder members Iain Hauxwell, Gerrard Yellowley and Douglas Shield. 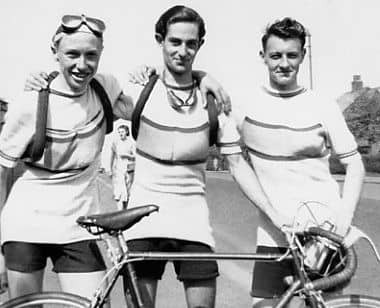 Winning team in the Denton Grand Prix road race 1952. Since its formation the club has produced many notable riders who have won many honours at national and international level. The 1960's saw the golden era of the club with riders of the calibre of Ray Wetherell (winner of over 200 Road Races as well as rides in the 1965 & 1968 Tour of Britain). 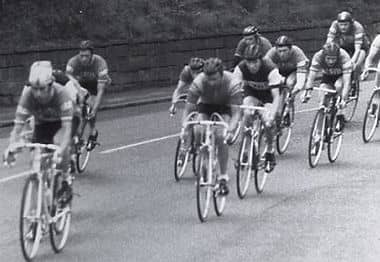 Kevin McLane Winner of the Onchan Cup in the IoM week, Dave Watson, one of the most talented young riders of the era with many notable wins to his credit including "The Four Dales" two years in succession as well as Divisional Champion. Jim Anderson, Divisional Champion and local BBAR Champion on several occasions. Derek Reay completes this impressive line up as National 50 mile record holder. Gosforth Road Club before start of the Beaumont Trophy 1978. Standing L-R Dennis Fairley, Peter Harrison, Dave McCready, Paul Lognonne, Jimmy Clarke, Geoff Dobson, Mal Dewar Kneeling L-R Dave Watson, Colin Clayton , Peter Longstaff, Paul Blackett. 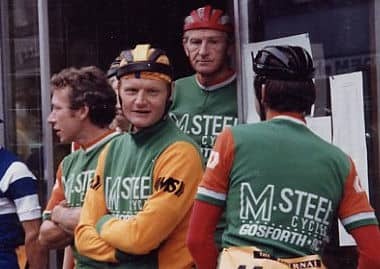 In the late1970's the club had a very strong road team lead by Paul Blackett, a legend in his own lifetime and one of the most respected riders in the country for over 30 years. On the track there was Russ Snowdon, the White Hope Sprint Champion later to become the National Veteran Sprint Champion. Mick Bradshaw dominated the late 1970's as a National Time Trial Champion and record holder at both 25 and 50 miles. 1st Stage Journal 2 Day coming in to Morpeth for first Hot Spot sprint. Riders in GRC colours in photo L-R Dave McCready, Jimmy Clarke, Mal Dewar, Paul Blackett, Peter Harrison. 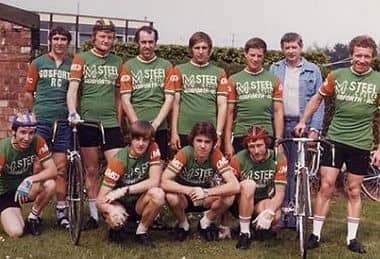 In the early 1980's, Joe Waugh joined the club, as, at the time the club was sponsored by M. Steel Cycles. He was Commonwealth Games Team Time Trial Champion in 1982, KOM in the Tour of Britain and second overall (on team orders by two seconds.) and three times riding for Great Britain in the Olympic Games. 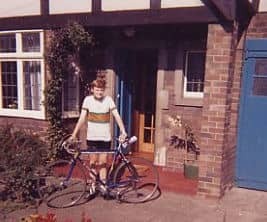 Other notable riders in the 1980's and early 1990's were Simon Campbell (National Squad member), Ian Norris, Dave Scrivner and Dave Howcroft (Yorkshire Junior RR Champion. There are, of course, many other riders who have contributed to the clubs' many successes over the years. Journal 2 Day - before the start of the 2nd stage in Berwick. L-R Mal Dewar, Peter Harrison, Ron Longstaff and (back to camera) Dave McCready. During the 1990's and into the new Millennium the Club produced very riders competing in Road and Time Trial Events. However there were still riders competing not only in these two disciplines but also on the Track (both in the NE and at the new National Velodrome) as well as Randonnee (before the advent of Sportives) and ATB Races at all levels. As of December 2018 the club has 61 paid Senior members and is growing at a constant pace due to the introduction of a Go Ride Section in 2007. This section has added 105 members to the club and is the fastest growing section due to the devotion of the club coaches which now number 10.The club has purchased five new trophies. Two of the trophies are awarded for Time trialing over a season long competition. They are for seniors and veterans. There are also Trophies for the Youth Section as the club continues to encourage youngsters to join and compete in all disciplines in their own age groups. The club has also recently acquired a Trophy which will be awarded to the most improved rider in the club. There are also two further trophies, the Sloan and Beaumont Trophies These are awarded to the winners of the two open road races the club promotes. There is also the Hill Climb Trophy which is awarded to the winner of the club's annual Hill Climb. In August 2010 the club became a British Cycling Go-Ride club and in 2016 was awarded Club Mark Status which is awarded to those clubs who have achieved excellence by Sport England. The Sloan Trophy was donated to the Club by the Sloan Billiard Rooms in 1952. The Billiard Rooms were located in the Bigg Market and it was common for club members to socialise there as there was virtually no household TV's in the 50's and certainly no i Pads! The race was run on the same day as the Beaumont Trophy with all club members who were not competing in either race expected to act as marshals.Originally it was for 3rd Category seniors and Juniors and as British Cycling was not formed until 1959 they were both run under BLRC regulations. Both the Beaumont and Sloan Trophies are the two oldest races in the UK.